We are a leading Manufacturer of black pepper and green cardamom from Mumbai, India. 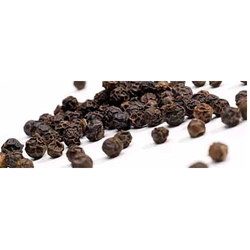 Black Pepper offeredcomprise organic grown spice that is extensively used in food preparations as well as provide suitable cure against number of health issues like anti acid and digestion among others. Made available in whole seed form with maximum moisture content of 13%, we can offer it in different weight packaging options to pick from. Some of its benefits include support increasing hydrochloric acid secretion in stomach for facilitating digestion; help to prevent formation of intestinal gas; promote sweating and urination for removing toxins from body; support removing excess water or accumulation from body among others. Green Cardamom or Elaichi cultivation is our forte. We are Cardamom cultivators from Munnar, in the pristine valleys of Kerala, India. We have a strong network of the farmers in the region and we are in a good position to directly procure the spices from these farmers. 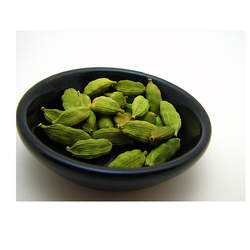 All the cardamom pods are of the Best Quality, Best Color & are filled fully with the seeds inside. Quality & safety are completely assured.